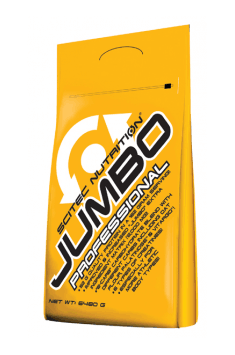 Scitec Jumbo Professional is a carbohydrate-protein gainer containing a mixture of carbohydrates with different absorption times and a large portion of full-value protein. The preparation is enriched with numerous ergogenic ingredients, including a few forms of creatine, a specially selected mixture of amino acids, BCAA, l-arginine, L-ornithine hydrochloride, calcium alpha-ketoglutarate, magnesium carbonate, alpha-lipoic acid, vitamin C, magnesium, potassium and Bioperine®. Carbohydrate-protein supplements are colloquially called gainers. They are the preparations enabling rapid weight gain, including the muscle mass. Products in this category, in addition to carbohydrates and proteins, are very often enriched with substances that increase their anabolic effect. Whey protein contained in the product is considered a wholesome source of essential amino acids of high biological value. In addition, it has a very good digestibility index and fast absorption time. A large amount of high-quality protein contained in one portion of the product allows the maintenance and development of the muscle tissue. The product is ‘equipped’ with a carbohydrate mixture containing both simple and complex carbohydrates consisting of oatmeal, maltodextrin, isomaltulose which is a valuable carbohydrate with a low glycemic index, dextrose, fructose and waxy corn starch. The content of carbohydrates with different absorption times has many advantages. Simple carbohydrates provide a quick energy source and instantly supplement the depleted muscular glycogen stock during the exercise. The content of complex carbohydrates allows you to avoid insulin spikes and sudden drops in blood sugar levels. The mixture of both types of these ingredients enables the long-term glycemic stabilization and stimulates the release of insulin, which is an anabolic hormone. The product also includes a creatine blend that contains creatine monohydrate and its micronized form, creatine citrate, Kre-Alkalyn® being a buffered form of monohydrate and creatine pyruvate. Regardless of the form, creatine is one of the best available ergogenic substances, the effect of which has been confirmed by numerous studies. Creatine supplementation enables better regeneration of ATP during the strength exercise and speed-strength efforts, and thus helps to cover the muscles' demand for energy and facilitates the continuation of the exertion. The blend includes taurine, L-glutamine, L-alanine, beta-alanine, L-phenylalanine, L-lysine hydrochloride and L-carnitine L-tartrate. Taurine is a popular addition to creatine stacks where it acts as a ‘transporter’ for this substance. The demand for glutamine increases during the intense periods of training, and its proper level positively affects the body's immunity and positive nitrogen balance. Alanine is one of the elements determining the occurrence of gluconeogenesis. Beta-alanine supplementation increases the level of carnosine in the muscles, which prevents the reduction of pH in the muscle cells and allows the improvement of exercise capacity. L-phenylalanine is an essential amino acid, so it must be supplied with food or in the form of supplements. Lysine participates in the process of repairing the damaged tissues, so its proper level should be ensured in particular by people practicing sport intensively. Tartrate improves the bioavailability of L-carnitine, which acts as a transporter of long-chain fatty acids to the mitochondria, where they undergo β-oxidation. The BCAA consists of L-leucine, L-isoleucine and L-valine. It is a set of amino acids characterized by different metabolism, which is used to a large extent for energy needs at a time when there is a poorer availability of other energy substrates. Numerous studies confirm that an increase in the level of these amino acids in the blood during the physical exercise can protect the muscle proteins against the breakdown. The muscle pump is a desirable phenomenon among the athletes practicing bodybuilding and strength sports. The list of benefits resulting from this physiological condition in which more blood flows to the muscles does not only concern the visual aspects. In addition to the fact that the muscles become much larger, they also receive more blood rich in oxygen and nutrients. The presented supplement contains L-arginine and L-ornithine hydrochloride, which contribute to the increased production of nitric oxide (NO) enhancing the phenomenon of the muscle pump. The effectiveness of the product is increased by the content of additional ingredients, including alpha-lipoic acid, vitamin C, magnesium and potassium. Alpha-lipoic acid is involved in the energy metabolism and has antioxidant properties. Vitamin C supports the proper functioning of the immune system, both, during an intense exercise and after it, it also helps protect cells from the oxidative stress. Magnesium and potassium are important electrolytes present in the intracellular fluid. The product is enriched with black pepper extract standardized for the content of piperine - Bioperine®. According to the producer, this ingredient can be co-administered with various nutrients to increase their bioavailability. In summary, Scitec Jumbo Professional is a carbohydrate-protein supplement, which was composed to support physically active people characterized by a very high energy demand, having very fast metabolism and having problems with taking such a quantity of nutritious food that would enable them to build the muscle mass comfortably. The regular supplementation with the presented product will also benefit all people who want to provide an additional source of nutrients during the periods of dynamic growth of the muscle mass. Banana: ultrafiltered whey protein concentrate (made from milk, instilled with soy lecithin), aroma (banana), thickener (xanthan gum), sweeteners (acesulfame K, succorose). Chocolate: ultrafiltered whey protein concentrate (made from milk, instantized with soy lecithin), cocoa (10-12%) in reduced-fat powder, aroma (chocolate), thickener (xanthan gum), sweeteners (acesulfame K, sucrose) . Raspberry: ultra filtrated whey protein concentrate (made from milk, instantized with soy lecithin), aroma (raspberry), acidity regulator (citric acid), thickener (xanthan gum), dye (carmine, 4R **** crust), sweeteners ( acesulfame K, suclarose). Multi-component supplement that intensifies termogenesis. Facilitates redution of body fat.